This is where you can talk about LEGO's I recently built a motorized winch that can move around. I just got a creator set for Christmas. I also got a Star Wars AT-ST set, I've already built both of them. Should I find some pictures? Here's the last Aetherlight Lego battle scene. Enjoy! I was wondering about this. Those two topics are about Aetherlight. This topic is for LEGO in gereral. What's the call here? -squints- I've been trying to decide. I think this topic is acceptable, since the other topics are specifically about Aetherlight Legos (not-Aetherlight Legos wouldn't fit in those topics). The Lego topic itself is definitely broad enough to have its own page. Considering those, I think it's okay. The Lego ones just about lego, the whole thing. On the topic of Lego, my brother once made a stopmotion video of Indiana Jones stealing a rocket from the Nazis The car chase scene at the end was really good, I wish I could show you guys! Maybe you could make a Tenor GIF out of it! I'd love to see it! Stopmotion videos are so cool! Once when I was little, I made a stopmotion video of a Rebel pilot getting into his X-Wing and taking off. It's amazing how many photos you have to take for it to be even relatively smooth. Neat! Yeah, so what’ a Tenor gif? Stop motion with Lego's holds a special place in my heart, it'll always be a favorite of mine. I think you can make them on Gifs.com! 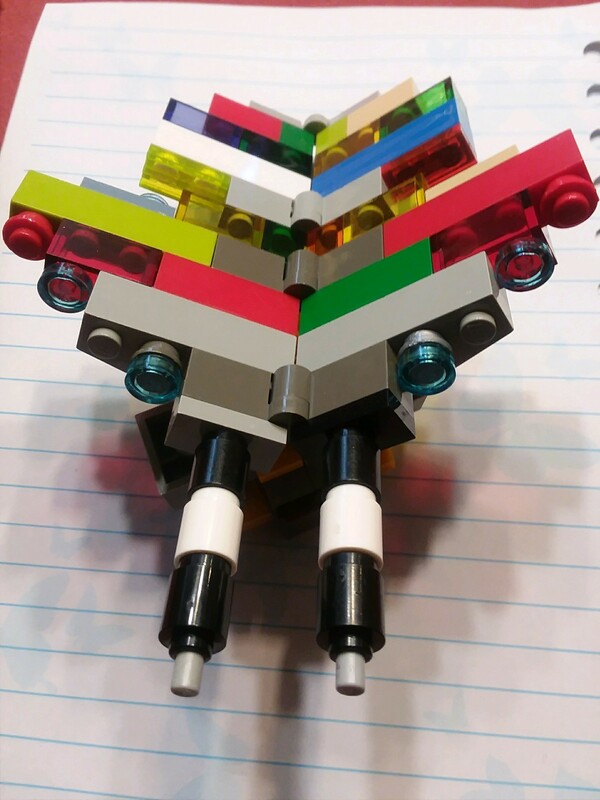 I made an engine power combiner. You can get Lego spices designed to add the cogs to do the same thing. It’s really handy, plus I have an extra one from an extra set my brother got that we already have. I made a floating-Motorized-steer-Gunned-Able-Remote-control-LEGO ( ) boat. Has any one here heard of Sbricks? I got one to put in my Racer. Some of those pieces look very old, or is it just the camera? @Kieran_Candleview1, just use technics, or mindstorms. I have those, they’re the actual lego stuff.